Among other subjects, The Consul is about the tyranny of bureacracy. 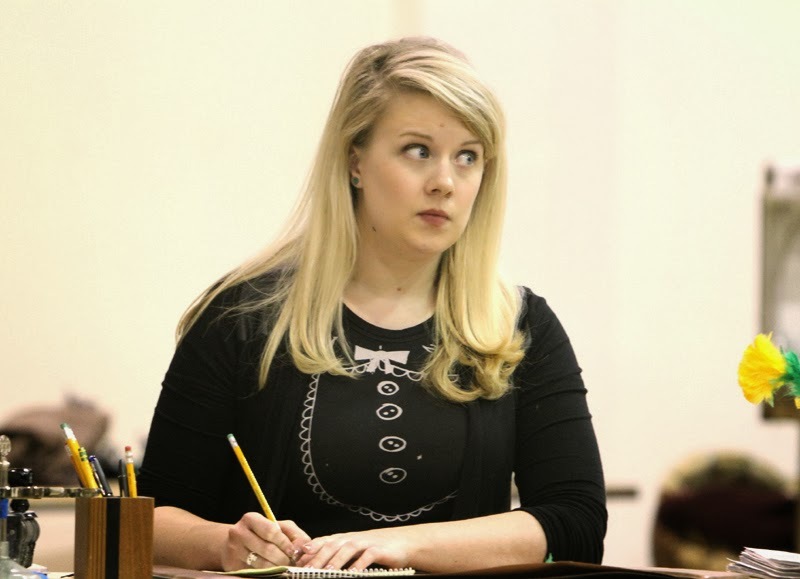 The human face of that oppressive system is The Secretary—in our production, the great Sarah Larsen. Sarah graduated from our Young Artists Program last year, and has already made a great impression on our mainstage in a variety of roles—Suzuki in Madama Butterfly, Tisbe in La Cenerentola, recently a very snazzy Maddalena in Rigoletto. Fascinated by the Secretary, she’s been wanting to take on this role for years. We spoke the other day about this wonderful character and about this remarkable opera. 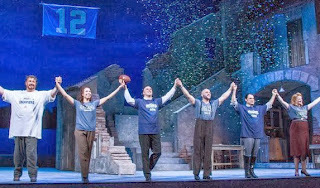 It looked like you all had a good time, after the final performance of Rigoletto, bowing in your Seahawks jerseys! That was so fun, and especially cool to see the Italians in the cast—Marco Vratogna, Francesco Demuro, Riccardo Frizza, and most of all Andrea Silvestrelli—get into it. They really embraced it. We thought the crowd would like it, but I don’t think we were expecting the response we got, especially when the 12th Man flag came down—it became just Justin-Bieber-concert screaming! What was your experience like, doing Rigoletto? Maddalena is definitely a unusual part in that she’s only in Act 3. And while it’s fun to just show up, do your one scene, and then go home, I do feel like I missed a lot—the camaraderie of the production. Maddalena never sees Gilda or Rigoletto onstage (except when we kill Gilda). I didn’t even meet the performers for the Act 1 dance sequence until late in the game. But if you’re only going to do one scene—Act 3 of Rigoletto is pretty awesome! Do you prefer doing familiar audience favorites, such as Rigoletto, or new & unusual operas like The Consul? I’ve been wanting to do The Consul for about ten years. But those older, more standard works are around for a reason. 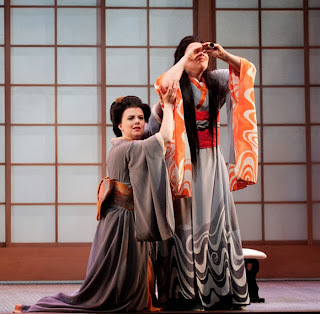 You can’t beat Madama Butterfly; it’s such a cathartic experience. But a piece like The Consul may have more impact than a Butterfly—particularly when it’s done properly, as is the case here. 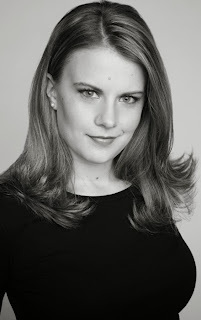 Rigoletto features lots of awful characters; but your character, Maddalena, is really the bottom of the barrel. Now are you the bad guy in this opera, too? When my mother found out I was doing this opera she said, “Oh, I can’t wait to see you be the Evil Secretary!” And I said: “Mom! Don’t say that! She’s not evil, she’s just doing her job.” She hears sob stories every day; she can’t invest herself in them. She has to go by protocol, or she’d be a basket case. I think she’s a real person, a human being. But yes, most people think of her as this iconic, quasi-military figure. Is her harshness there in the music? Definitely. In fact, it was originally just a speaking role. Oh! She had no soul, so she never sang. Even in this version, it really does feel like I’m just talking. It’s so well-written for where my voice sits. In several of the older recordings, you hear lots of speech-singing with this character. Do you know anyone like the Secretary? I see a lot of myself in her. That’s why it’s a little scary doing it! I’m very much someone who goes by the rule-book. I love rules. And it’s tricky both to have a heart AND have a rule-obsessed personality. I think she’s a good villain-figure in the first half of the opera—we need someone as a focus for our anxiety, that lack-of-getting-forward. But it’s good that she’s not a target for the entire thing. In the second half, she really tries to help, in what way she knows that she can. Which came first: her job, or her rule-obsessed personality? I don’t know. I know she’s holding on to this job for dear life. Some of the bitchiness we associate with her comes from trying to keep her job. In a world where women could be Guest Columnists at Ladies’ Home Journal...this is a good job. What else do we know about the Secretary? Does she come from Magda’s country, or the Consul’s country? She is definitely a citizen of the other country. “I don’t see how we can help you,” she says, “You’re not even one of our citizens.” There’s definitely a prejudice against outsiders. Well, her job is to protect the borders of her own country. Where do we find out who she is, musically? The line she says the most is: “Next!” But you don’t really sing that. No, that’s just spoken. In some cases with her speech-sing passages, there’s a note that’s referenced, but in some cases you have to remember not to sing at all. It’s hard to memorize. There’s an amusing scene where you speak ‘coquettishly,’ when you get a call from your boyfriend, or somebody like that. Yes...the problem is, everyone in the house has to be able to hear it, so you have to have this intimate phone call—for 3,000 people! In her ideal world, what would make the situation better? That there be fewer of them? I think in her perfect world, every Consulate visitor would be like Vera Boronel. You mean, able to pay her way through? Yes, the Secretary respects Vera, because of her money; but also, Vera manages to get all her papers in. They sing this cheery little duet in Act Three, where they’re stamping and signing things, and it’s very happy and light! Seems to me the most terrifying part of the entire opera! That should be happening every day. All the characters should be singing a happy little duet with the Secretary, because everyone should be able to get through. But that’s not how it works. So, when you reject Mr. Kofner because he brought the wrong-size photographs, it’s not that you’re delighting in being able to frustrate him once again. No, no, if I could just NOT search for that file for the fiftieth time because someone hasn’t brought in their health certificate unnotarized...that would be really great. Do you prefer doing the more old-fashioned bel canto operas, the ones that are more like a concert, or a real hard-core music drama like this one? I’ve had a good mix of both, which is great because one side of the art form teaches you about the other. A work like this, with so much going on, can inform what you do in a more static work, where you have to fill in the gaps yourself. And does doing a good old “park ‘n’ bark” opera inform your work on an opera that’s more a play, like this one? You learn to be okay with silence. And stillness. Rather than shoving your voice and your character in the audience’s face, there’s a way of bringing people in, of quietly saying “Come, listen to me.” Stillness can be mesmerizing. Interesting, that happened in Rigoletto, in “Caro nome,” the big soprano aria where she was lying on her back. 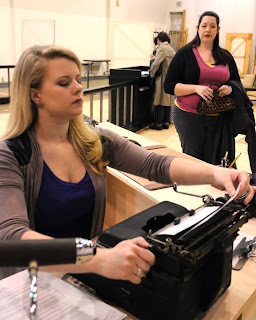 The story had basically stopped; she was alone onstage, there were no new supertitles ‘cause she was just repeating the text, and it was the biggest show-stopper moment in the opera. Yes, the vulnerability you can find in scenes like that can be really cool. How is your work on The Consul going? One of the things that’s nice is that everyone in this cast has worked with Peter [Kazaras, the stage director] before. Peter has this wonderful way of telling you all the things you’re doing wrong, while at the same time making you feel that you have something important to give as an artist. In a Peter show, I always know that I will never look bad. He will never send me out there with egg on my face. On the first day of rehearsal, I thought it was amazing when we went around and everyone shared real-life Consul-esque experiences. Yes, that was an eye-opener for me, too—it really put this piece into context, to see how real it was for real people. Many of the people working on the show have lived through this. What would you tell someone who’s nervous about coming to The Consul because they think it’ll be a downer? Oh, come on! Rigoletto? Depressing! It ends horribly! The theater scene in Seattle is thriving, and lots of great theater pieces are downers. This piece might initially scare some people because it’s so immediate, it’s so accessible. It’s not escapism. This situation is certainly happening right now, all over the world.